Intercultural communication takes place whenever individuals or groups from different cultural or linguistic backgrounds share and exchange meaning in a manner that is influenced by their different cultural perceptions and symbol systems, both verbal and non-verbal. By explicitly teaching the knowledge, skills and attitudes which contribute to effective and positive intercultural communication, we are able to provide students with the vital tools needed to engage with and contribute to today’s increasingly diverse and complex world. The teaching of intercultural communication opens up new ways of viewing and engaging with the experiences and texts which students encounter in their lives and studies, and it also provides rich opportunities for reflection, critical thinking and self-awareness. Intercultural understanding is identified in the Australian Curriculum as an essential capability for living and learning and, as such, it should inform the choice of learning experiences and content in all Key Learning Areas. 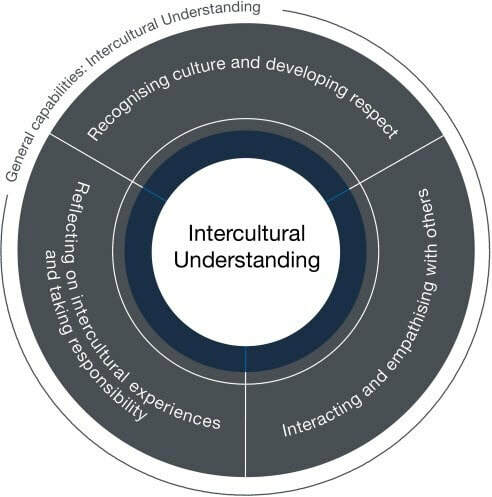 The key ideas for intercultural understanding are organised into three interrelated elements in the learning continuum, as shown below. The learning continuum describes the knowledge, skills, behaviours and dispositions that students can be expected to develop at particular stages of schooling. Is there a difference between intercultural communication and intercultural understanding? The difference between intercultural communication and intercultural understanding forms the basis of many scholarly debates. In simple terms, intercultural communication is an active process. It happens when two or more people from differing backgrounds interact. It assumes the participant is involved in the interaction. In contrast, intercultural understanding may not involve the participant in the interaction. It is a comparison of how people from different cultures interact with the world. Intercultural understanding can occur without intercultural communication, but may also occur as a result of intercultural communication.